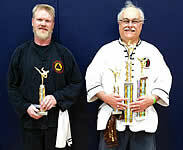 New Team Members Mark, and Viviane both won trophies in their first tournament. for going to Topek to support the school! 2019 MCMAC Team Results ~ 2 competitors - 4 Medals, and "SportsmanShip Award"
with Master Winokur presented various awards to All the students who attended. in the private room we were using. for supporting our school, It helps when we have a strong Team! 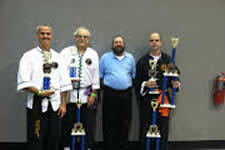 Sifu Tim was a Judge for the first time at this event. 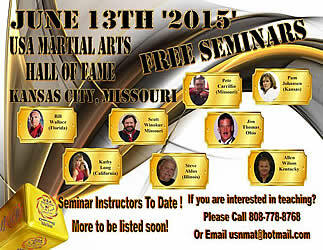 Midwest Chinese Martial Arts Center this year! Great Job! 2018 Midwest Chinese Martial Arts Center Team! 2nd pic( right to left) Zach, Bill,Siena, Joel. to the Campers and Camp Counselors, Then taught a short class session, they all learned Shaolin Kung Fu Leopard form & more! (Pic 2) Joel Storm wins 3 and makes the "Wall of Fame"
Joel S. and Adam K. both won 3 Awards in the same event, and make the school "Wall of Fame"
who came out to support our competitors! 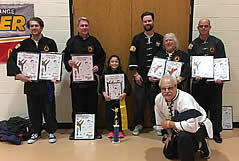 (pic 2) Siena L, with Master Winokur, Both Tim M, and Adam K, both make the school "Wall of Fame"
This was a very large event with many seperate divisions of forms, and weapons, both traditional and sport style martial arts. We saw schools from many cities around the USA, we witnessed a wide variety of unique and interesting styles. 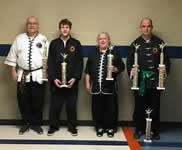 competitiors from MCMAC, who represented our school and make our kung fu styles, and our weapons forms be seen! 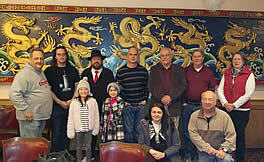 Congratulations all Competitors from our school Midwest Chinese Martial Arts Center and thanks to our Team of spectators. 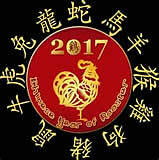 2017 Midwest Chinese Martial Arts Center Team! 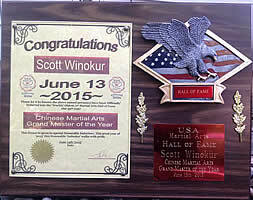 School members above display their awards, with 8 Animal, White Willow, and Kickboxing Styles represented this day. Congratulations Joel on winning 2017 Triple Crown Award! Joel Storm, and Adam Kijowski both won 3 awards and make our schools "Wall of Fame"
Joel Storm won 3 Awards and makes the school "Wall of Fame"
Adam K not in picture won 3 - 1st place trophies, and makes the school "Wall of Fame"
fellow students and friends for your support at this year's event! 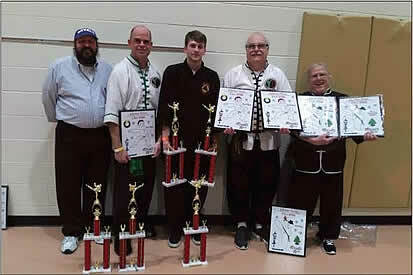 Tournament Results: 4 Competitors - 10 Awards & "Jerry Lemmon Sportsmanship award"
Joel S., & Adam K., Each Won 3 Awards in the same event & make the school "Wall of Fame"
Above Grand Master Winokur with MCMAC Team, (Right to Left) Master Winokur, Joel S., Adam K., Tim M., & Michelle K. , display their awards. Joel S, and Adam K with 3 Awards each to earn a place on our schools "Wall of Fame"
~ Michelle K (8 Animal Brown) 3rd Tiger Broadsword, 3rd Tiger/Crane, "Jerry Lemmon Award"
Thanks to all who attended event and supported our team! * Great Job students and instructors for MCMAC, thanks to Sifu Leslie for shooting the video, and our spectators who came out to support our school team! 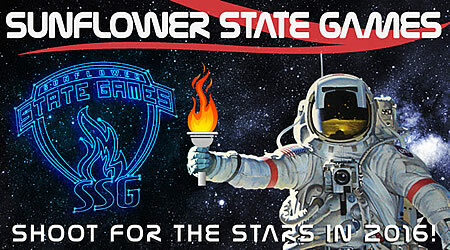 Congratulations to Joel S., who won 5 Gold Medals at the same event! 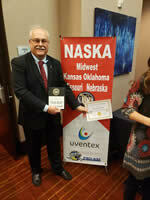 Thank you to Tate who drove, took pictures and videotaped competition. 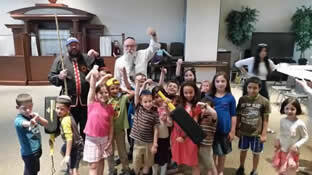 Iron Palm Training is special training to condition hands:, palms, back of hands, and fist's. and willing to follow training rules, and directions of instructor. 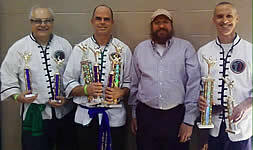 1st Hung Gar Tiger, 2nd White Willow form #3, 2nd Intermediate Sparring. 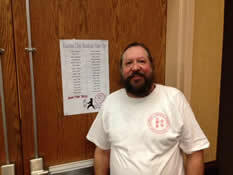 Congratulations to Joel S, who won 5 Trophies at Hall of Fame Classic Tournament! Great Job! Thank you to Tate M, who drove Joel to the Hall of Fame Classic, representing our school. in both Advanced forms and weapons. 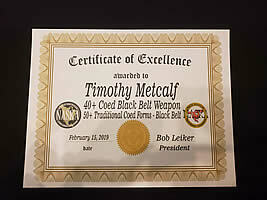 He was the only competitor from Midwest Chinese Martial Arts Center this year. 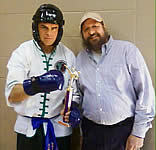 Great Job Charles G who was moved from Beginner to Intermediate Sparring and still won 3rd! Great Job MCMAC Team! We are so proud of all our competitors, Congratulations to all winners! 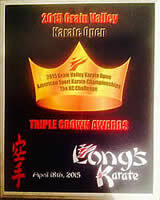 Joel S. won 5 Trophies at this event! 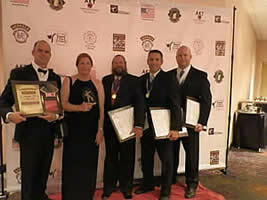 Event Results: 5 Competitors - 10 Awards & Triple Crown Award presented! 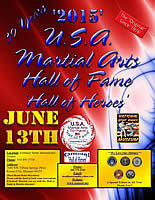 Congratulations Joel S. who won 3 Trophies in this event and makes the school "Wall of Fame" and Mitchell P. (16 yrs old) from Bamboo Forest Kung Fu (Sifu Leslie Goad's student) won 1st in Teen Form, and 2nd in Teen Sparring. Nice job both competitors! 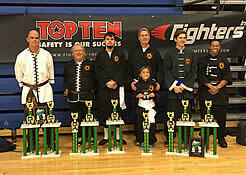 Congratulations Sifu Leslie who Judged Black Belt Forms/Weapons in this event, as well as her student Mitchell P., attended, and won 2 Awards in his first Tournament. He earns a spot on the school "Wall of Fame"
Fantastic showing from our Competition Team this time of -Tim, Joel, Lilia, Tate, and Guy. 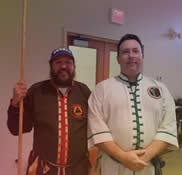 Thank you to all the spectators from our school that made the journey to support our Team, Thank you to SiGung Scott, Sifu Leslie, Cleo (Brown Sash), and Scott L., in picture above. Many others including Tate, (who competed), not in picture were there in support! 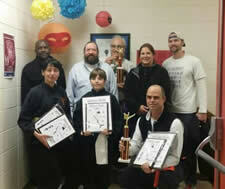 Joel won 3 awards,(in the same tournament) and makes our school's "Wall of Fame"
Save $20 off 1st month only. Normal Price 2nd month. Bring a Friend Special. First Student pays full price. 2nd Student 1/2 Price 1st Month Only. 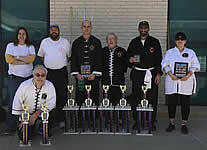 On March 30, 2013 our MCMAC Team competed at the St Jude Childrens Research Hospital Annual Tournament in Topeka, KS. 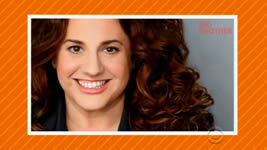 Hosted by Master Pam Johanssen. Master Scott thrilled the audiences with his Cane Form and the Chi Lu Chuan Tiger Crane Form as well. 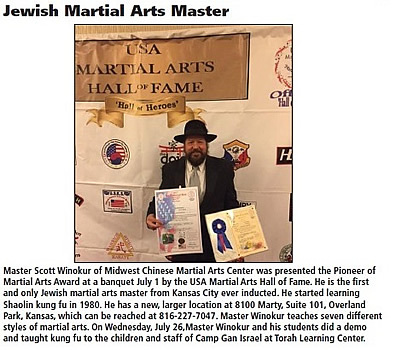 On February 5, 2013, Master Winokur received his Doctorate Ph.D. in Martial Philosophy. Dr. Scott's dissertation can be found in the Library of Congress. Happy Birthday to all those born in October! 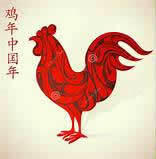 Tell them we recommended them and receive 10% off your meal! 2 competitors 6 Medals Great Job we at MCMAC are all proud of you both! Please call for an appointment Serious Students Only !